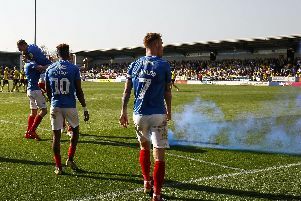 Dave Wright has returned to his hometown club – and aims to impart his extensive knowledge of the youth game on Pompey’s academy. The former Medina Primary School teacher has been added to the Blues set-up to drive the recruitment of youngsters aged eight to 21. Wright, 38, left a role auditing academy set-ups for Belgian-based company Double Pass to rejoin Fratton Park for a third stint. He was a talented footballer in his own right at Pompey. After captaining the youth side, he moved to Crystal Palace – before his career was cut short by injury. After going down the coaching path at the Blues following his enforced retirement, Wright’s journey then took him to Stoke City, where he headed up their youth set-up. But all roads have led him back to PO4 – and Wright is relishing the opportunity. He said: ‘I’m delighted to be back at the club for a third time. ‘Being from the area, I have an affinity with the club as it’s the team I grew up supporting and captained at youth level. ‘It’s something I couldn’t really refuse. ‘The circumstances had to be right for me to leave my former role – there aren’t many clubs I would have left it for. ‘I could have quite easily stayed doing what I was doing and I was learning a lot, going around and helping every academy. ‘I’ve seen how operations work at the likes of Liverpool and Chelsea. ‘Throughout my time I’ve seen what goes on in near enough every youth set-up across the country. The vision of Pompey owner Michael Eisner is to see more local talent emerging into the first team. Conor Chaplin, Jack Whatmough and Ben Close are just three members of Kenny Jackett’s squad who have established themselves in the senior set-up after coming through the youth ranks. Wright is aiming for more of the same in the years to come. He added: ‘If you look at things, Pompey have one of the best records in the country for developing players into the first team. ‘There’s the boys in there now, then you’ve got Matt Richie, Joel Ward and Adam Webster who have moved on to play at a higher level.